The Pentagon letters may contain ricin, while the Cruz letter contained an unknown white powder. The Secret Service said in a Tuesday evening statement that it intercepted a "suspicious envelope" addressed to the president. The mail was intercepted at a location outside of the White House. The Secret Service provided no other details about the envelope. "We can confirm that we are working jointly with our law enforcement partners to fully investigate this matter," it said in a statement. "Further, all threats directed towards the President, or any Secret Service protectee, are treated seriously and fully investigated." Earlier Tuesday, two people were hospitalized in Houston after a "white powdery substance" was found in a letter addressed to the campaign headquarters of Texas Sen. Ted Cruz in Houston, law-enforcement sources said. The condition of the victims was not clear. The Republican senator's spokeswoman, Catherine Frazier, said no Cruz staffers were taken to the hospital. Frazier added that the package was opened in the lobby, resulting in a temporary lockdown. The Houston Fire Department said in a tweet that the ninth floor of the Phoenix Tower was evacuated as a hazmat team worked to determine the nature of the substance. The Houston scare came to light hours after NBC News reported that two suspicious envelopes containing the deadly toxin ricin were mailed to a Department of Defense mail processing center. The envelopes were addressed to Mattis and Chief of Naval Operations Adm. John Richardson, a source familiar with the incident told NBC News. There were no indications anyone had been exposed to the suspicious substance, the source said. The mail facility is on the Pentagon campus but not within the main building itself, said Pentagon spokesman Christopher Sherwood. Law enforcement officials said all four letters, including the two sent to the Pentagon, appear to have come from the same person. Col. 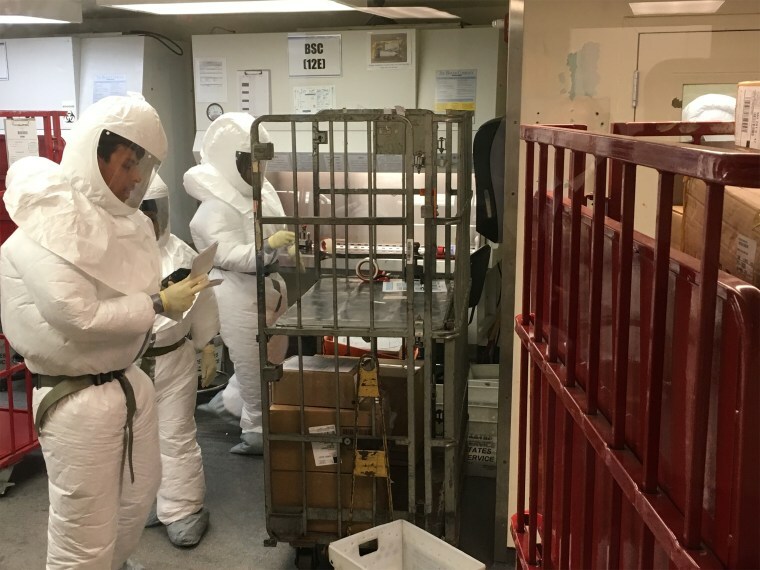 Rob Manning, a Pentagon spokesperson, said in a statement that on Monday the Pentagon Force Protection Agency "detected a suspicious substance during mail screening at the Pentagon's remote screening facility." "The envelopes were taken by the FBI this morning for further analysis," he said. All United States Postal Service mail received at the facility Monday is currently under quarantine, he added. A federal official said the ricin indication was based on a field test, and those are often unreliable. At this point, the official said, concern about these envelopes is low. The Department of Defense facility processes roughly 500,000 pieces of mail each year, a defense official said. The mail is screened by employees who wear white protective suits. Once the mail is screened, a sample from each parcel is then taken to a lab for further testing. Each piece of mail that is deemed "normal" is typically released within 24 hours. Any mail deemed suspicious is quarantined in another room, the official said. Ricin, a lethal poison produced naturally in castor beans, has no known antidote and cannot be quickly detected. A dose the size of a grain of salt can be fatal if inhaled, injected or ingested. In May 2013, ricin-laced letters were sent to then-President Barack Obama and then-New York Mayor Michael Bloomberg. No one was seriously hurt in the incidents. Shannon Guess Richardson, a former actress from Texas, pleaded guilty to the crime. Prosecutors said Richardson, 35, who had minor roles in the TV series "The Walking Dead" and the movie "The Blind Side," sent the letters in a bid to set up her estranged husband.